Fourth-year sociology major Corinne Warnshuis reports after winning a scholarship to attend the National Conference for Media Reform. 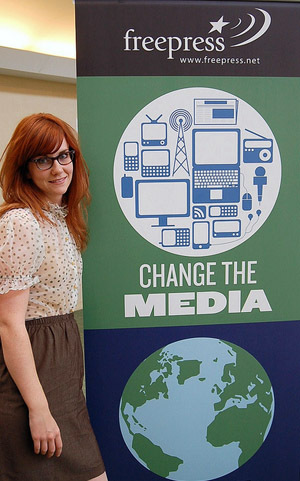 Corinne Warnshuis, a fourth-year sociology major at UC Santa Cruz, won a scholarship to attend the recent National Conference for Media Reform in Boston with an essay on media issues and media reform. "I feel really honored to have won the scholarship," said Warnshuis, who is also minoring in film and digital media. She said she focused her time there on issues of women and media. At UCSC, Warnshuis, from Salinas, has been involved in the student TV news program Banana Slug News, produced a short documentary on La Familia Center in Santa Cruz, and produced another documentary on New Urban Arts, during a stint in Providence. R.I.
Friends made in Providence led to an internship at public radio station WHYY in Philadelphia during the summer and fall of 2009. Warnshuis said she hopes to return to the station for another internship after graduation in June. I'm still trying to wrap my mind around the amazing and inspiring information presented at the National Conference for Media Reform in Boston April 8-10. The conference was the fifth of its kind over the past decade, gathering more than 2,500 media reformers, activists, policymakers, artists, students, journalists, and scholars under the motto "Change the Media. Change the World." Focusing on themes of media reform, policy and activism, the event kicked off early Friday morning with a live broadcast of "Democracy Now!" Host Amy Goodman was just one of the many luminaries I looked forward to hearing. Others giving lectures and speeches included renowned media scholars Jean Kilbourne, Robert McChesney, Stanford University law and technology professor Lawrence Lessig, and Nobel laureate Joseph Stiglitz. Many important policymakers from Washington also attended, including FCC commissioners and U.S. House of Representatives Democratic leader Nancy Pelosi, D-San Francisco. Among the topics were the current attack on federal funding of public media, including PBS and NPR (which, by the way, makes up less than 1/100th of 1 percent of the federal budget), recent mega-mergers (like AT&T’s acquisition of T-Mobile) and Network Neutrality. I spent most of my time in panels that focused on women’s roles in changing media. One panel on copyright issues included an inspiring feminist artist named Elisa Kreisinger who uses Fair Use to remix pop culture videos to create new narratives, resulting in some really interesting readings. Another panel brought together women from the National Organization of Women, ColorLines.com, Sister Song, and Women's Media Center in New York to discuss issues such as reproductive justice, pervasive racial stereotyping and women’s absence from media ownership. (Less than one-third of women are in decision-making positions in media). As a sociology major with a minor in film and digital media, I have been able to blend the two departments nicely to fit my interests, putting social justice together with critical cultural analysis. After taking Professor Herman Gray's illuminating seminar "TV & the Nation" during winter quarter, I went into the conference with an understanding of the history, structure, and political economy of the media, as well as a grasp of some of the current issues. One assigned reading was the revelatory Reality Bites Back: The Troubling Truth about Guilty Pleasure TV. Its author, Jennifer L. Pozner, who is also founder of the organization Women in Media and News, hosted a media literacy workshop that engaged participants to discuss the representations and stereotypes that reality TV shows reinforce. For me, one of the highlights of the conference was the chance to connect with and talk to such an accomplished and powerful feminist about her work. Although media issues are women’s issues, media issues are also universally human rights issues. Media issues affect everyone. When it comes to the media, everyone has something at stake, and everyone should understand its importance. Now back from the conference, I am excited to become educated on the issues, more engaged with the movement, and the many organizations involved, and I am more prepared to spread the word about the importance of media reform to the health and vitality of our democracy. For the next few days, weeks, and months, I will be doing more research on the issues, organizations, and presenters I learned about, and giving a more detailed re-cap in my blog -- dearmarthas.wordpress.com -- including videos from the conference.